I saw this while I was in Anthropologie last weekend and fell in love with how delicate and refreshing it is. 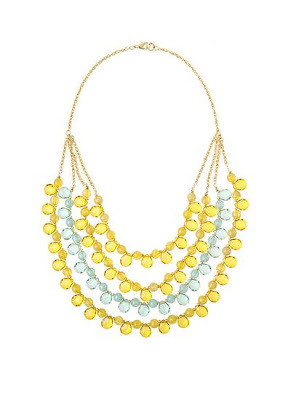 And as one of those whose skin tone inhibits me from actually wearing clothes in the color, this necklace would completely satisfy my yellow cravings. Wouldn't this be such a beautiful way to dress up a white T and jeans? *And surprisingly, it's not super expensive. *I would love to see a bride rock this. It's a great example of buying accessories you can wear after the big day.